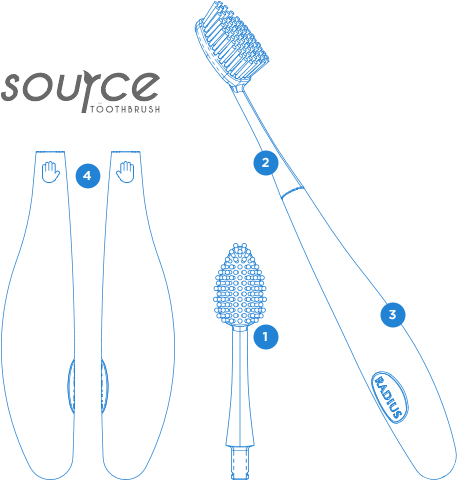 I was browsing around the MyPure website and saw the Radius Toothbrush. I was intrigued by the huge popularity of the brush in America and also by the Radius Challenge offered by MyPure themselves. So confident are they that you’ll love this brush, they’ll give you your money back if you turn back to your old brush after 7 days! Well, why not give it a try? MyPure were kind enough to send me one of the Radius Source brushes for free, and I am really amazed at just how much I love this toothbrush. It has a totally different shape with loads more bristles (65% more than ordinary brushes) and a much wider bristle area than a regular brush. To be honest, I never gave this much thought before, but now I’ve used this brush, the shape of standard brushes seems much less efficient and definitely inferior! This brush reaches a larger area, and feels much more gentle on the teeth – I believe this is because the bristles spread out over a wider surface area, thereby applying less pressure. It’s nice to hold the wider, ergonomic handle, it feels so much more comfortable and is designed to reduce and more evenly balance the brushing pressure. My teeth feel so much cleaner and smoother, even though the medium bristles feel softer than my usual brush. They look cleaner and brighter to me, and after brushing, I feel fresher and so much more satisfied with the quality of cleaning overall. The improved cleaning results are not the only benefit of this fantastic brush. They are environmentally friendly and will result in less waste, due to replaceable heads. Not only that, but each head lasts up to 9 months (3 times longer than a standard toothbrush head). The body itself is also made from recycled materials – options include wood, dollar bills and flaxseed. Really interesting and fun – at just £9.99 for a brush and replacement head, one of these would make a great, quirky gift for the environmentally concious friend/family member. Radius have a lovely range of toothbrushes for adults and children. They are an ethical company, who inspect their products by hand, are cruelty free and ensure a high level of sustainability. I can’t see myself going back to my old toothbrush now, and I think my husband has brush envy! Definitely the best toothbrush I’ve ever used! Thanks for reading. Have a wonderful day! I was sent this product free of charge by MyPure for review purposes. All opinions are my own. Next Post Ombar… New & Amazing Chocolate Alert!